The volunteers who host each July's week-long Venetian Festival in Charlevoix like to say that the event is only missing thing: a cost for admission. Free music, parades, children's activities and fireworks are all free. 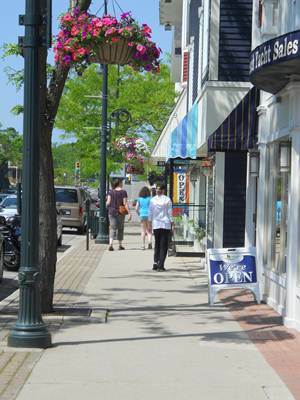 The Venetian Festival in Charlevoix has been a highlight of summer in Northern Michigan for 80 years. During the Festival, there are daily music performances on two stages in Charlevoix's East Park. Venetian Games include kids and teens in soccer, basketball, running, boarding, sailing, volleyball, golf and tennis tournaments plus a Battle of the Bands for youth musicians. Kids Day at Lake Michigan Beach includes an inflatable climb, ragamuffins theatre, twister joe, pony rides, bubble fun and craft tent. Water activities include a night boat parade--with boats decorated, animated and lit--and an AquaPalooza boating party take place on Round Lake in Charlevoix. The Charlevoix Venetian Festival queen is crowned in special festivities. The street parade is the place to be for fun, music, and craziness and thousands of people line the street to watch the floats. Two nights of fireworks? Yes, two! 2018 schedule. Check back for 2019 updates.